A new Steam client beta is now available that lets gamers take screenshots in any game and then automatically upload them to the Steam cloud. Gaming may be a solitary pursuit in many ways but showing off has always had its place in the experience. Back in the day we entered our initials into coin-ops, ensuring immortality until the owner turned the machines off at night, while the modern era is all about cheevos and Gamerscore. But a picture is worth a thousand words, as they say, so Valve is doing its part to ramp up the braggadocio by incorporating an easy-to-use screenshot system in the new Steam beta. It's a simple process. Press F12 in any game to capture a screenshot, which can be uploaded to the Steam cloud manually through the in-game overlay or automatically when the game ends. Screens can be managed through the Steam community site and shared with friends through Steam profiles. Currently the system is limited to games that use DirectX 9 or higher, although support for earlier versions of DirectX is apparently on the way. The latest Steam beta client also improves the audio quality of voice communication, changes how game invites from friends outside the chat stream are handled, adds a password strength meter and fixes a few miscellaneous bugs. To access the new beta client, select "Steam" and then "Settings" in the Steam client. On the "Account" tab, press the "Change..." button, then select "Beta Update" and restart the Steam client. 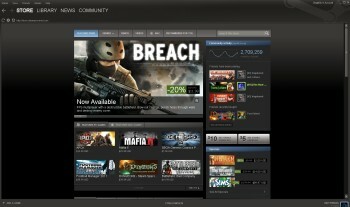 Discussion about the new Steam Screenshot feature is underway now on the Steam forums.